If there is one thing I could tell my friends from home that would surprise them the most to learn about me, it would be that I was on the chess team for all seven years of middle and high school. Eight competitors, three rounds, one winner. At the time I was embarrassed to attend practices and attempted to avoided the yearbook photos at all costs, but absolutely craved the intellectual competitiveness and strategic thinking the game of chess required from players. Admittedly, I wasn’t a very good player, and more than once was subjected to a tournament checkmate by a kid half my age sporting a Harvard T-shirt. However, I continued to play. My only opponent for the last nine years has been my loving husband (who has yet to win a match against me). I met my husband, Kevin, nine years ago at The University of North Carolina at Chapel Hill and quickly became indoctrinated into his unwavering love for and dedication to his dear Tar Heels. 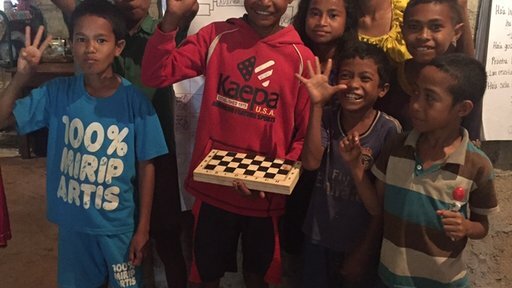 The idea for the March Madness Chess Tournament came at the perfect moment when a local kiosk from the villa began selling hand-carved wooden chess boards: March Madness was only two months away and our neighborhood kids were excited and ready to learn something new. Kevin and I decided that the kids would have to find interest in the idea of learning the game of chess themselves, so we strategically played a game against one another on our front porch in full view of the entire village. It wasn’t minutes until we were surrounded by a crowd of 20 or more kids, most of them our own English students. 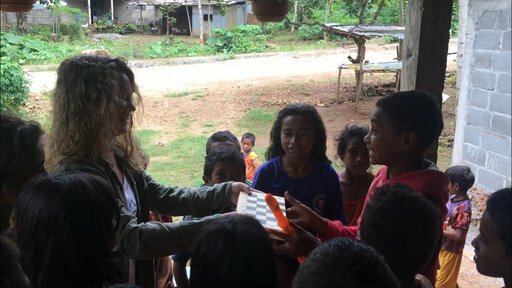 After only one game, the kids asked us to teach them how to play, and thus began the process of coaching chess to 15 to 20 kids over the next two months. Most days after school they would come over to ask for the chessboard to practice, while Kevin or I patiently sat nearby and coached them. 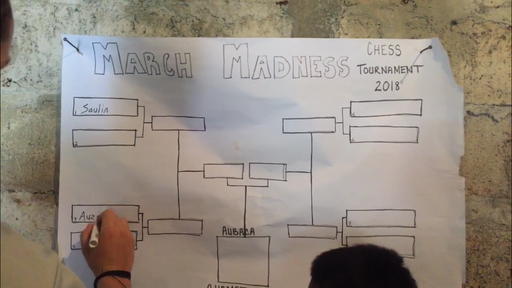 As March drew near, I sketched a tournament bracket with eight potential competitors, and we revealed the idea to the kids. They were thrilled and had a newfound energy to practice even more often. All fans' brackets were busted by the end of round one. 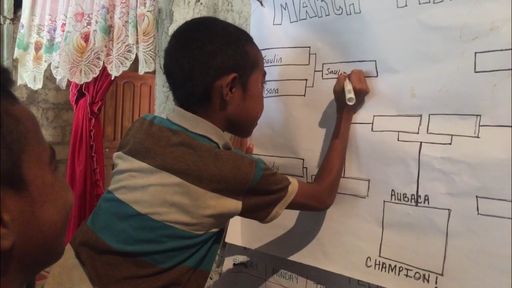 On March 8 we drew names for eligibility and let the kids draw numbers to determine their position on the bracket. For the 10 kids who weren’t chosen to play, we had them fill out their own bracket with their predictions for each round. Eight competitors, three rounds, one winner. Inner-family competitiveness, major upsets, last second game changers and an underdog victory. All fans' brackets were busted by the end of round one, but that didn’t stop a lively celebration at the end with the final win, complete with fans cheering the winner's name over and over again. The winners ceremony included the first place winner receiving a wooden chessboard of his own and a trophy with his name engraved, the runner-up a bag of Skittles (sent over from America) and some fruit and the rest of the competitors a single Blow Pop (also sent over from America). The winner received a wooden chessboard. Since our March Madness Chess Tournament we have taught an additional five girls the rules of the game, continue to coach the kids on new strategies, watched multiple Carolina vs. Duke games together and at the request of the kids have led an English class lesson on the names of the chess pieces in English. Needless to say, I am no longer embarrassed about my love for the game of chess, my husband has loved sharing his dedication to his Tar Heels with the kids and the kids have loved learning a new game. Chess is a game of peaceful, intellectual competition, using abstract and strategic thinking with each move. Much like in the game of basketball, a player must adjust moves based on the movements and counter-movements of the other player, creating a sense of resiliency. And if there is one thing I could tell my friends from home about Timor-Leste it would be that the people have an overwhelming sense of resiliency and strong desire to learn. Rebecca Longhany, MPH, RN-BSN is a Community Health Volunteer from North Carolina who is currently serving in Timor-Leste from 2016-18 with her beloved husband. Go Heels.